Guys, I dont know what is happening , help! There was a mismatch between the processor architecture of the project being built "MSIL" and the processor architecture of the reference "E:\C#\XAMARIN\SMS v.2\SMS v.2\bin\x86\Release\SMS v.2.dll", "x86". This mismatch may cause runtime failures. Please consider changing the targeted processor architecture of your project through the Configuration Manager so as to align the processor architectures between your project and references, or take a dependency on references with a processor architecture that matches the targeted processor architecture of your project. Hi, in the third picture , change the Release to Debug . thanks for your post, I had this problem, and your screenshot led me to those fairly well hidden settings, once I activated the x86 configs, the error was gone and I could successfully deploy to any Android emulator. Similar to Nimral, I was able to solve my issue as well. Many thanks Mike! same issue after upgrading VS to ver. 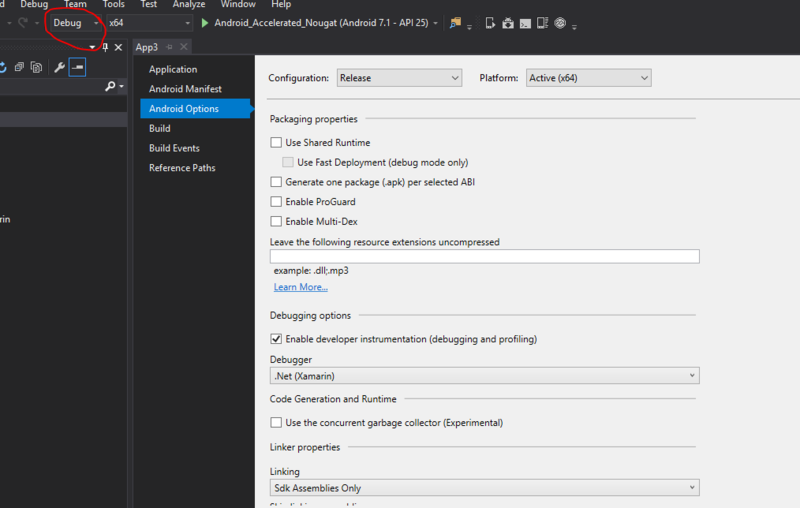 15.8.2 and Android SDK API 27. I changed the coniguration from "Any CPU" to "x86" and problem has gone. A "Clean soluton" was needed though. Thanks! Changing Release to Debug worked like a charm. Nice catch!